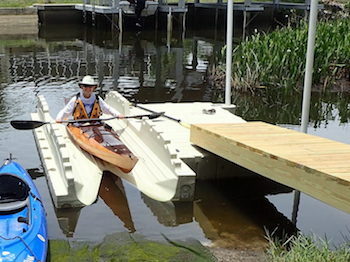 The new kayak launch at the Suwannee Community Center has been tested and given the thumbs-up by local paddlers Leroy Harmon and Debbie Meeks. Meeks reports that their kayaks were rock solid in the launch. "Beginners will feel confident getting in and out of their boats," Meeks says. "No more sinking in mud to your knees or slipping on wet carpet!" For those using the launch, the easiest way is to unload your boat on the grassy beach area in front of the launch, use your bow line to pull the boat into the launch while standing on the dock area, board your craft and shove off using your paddle as shown. Be sure to grasp your paddle near where it fits into the notches, not toward the middle which risks breaking your expensive paddle. During a paddling festival, kayakers can queue up and launch like skiers on a slope by preparing their boats on the grassy area. Many thanks to the Dixie County Tourist Development Council and the Dixie County Commissioners for this excellent improvement. Debbie Meeks demonstrates the easy launch. 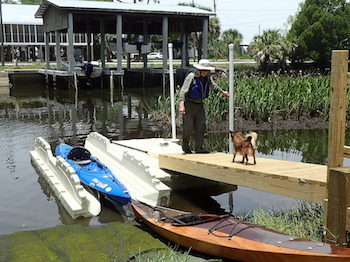 Leroy Harmon is greeted by his friend Red on the new kayak dock.